Its open-air opera festival in July has found an international following and takes place in the 7,000-seater Sferisterio - a monster of a neo-classical arena erected by private subscription in the 1820's. As you swoon to a Verdi aria, you might care to know that it was originally built as a stadium for pallone, or Italian football. The centre has a measured dignity fitting the place's solid, if unostentatious wealth. Its centre was almost entirely built between the 16th and 19th centuries. 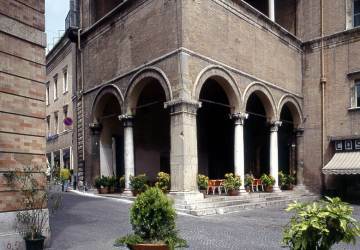 The Renaissance two-tiered arcades of the Loggia dei Mercanti on central Piazza della Liberta' is the town's most striking piece of architecture. The best of the city's palaces line Corso Matteotti, the road that leaves the square at the side of the Loggia, while Corso della Repubblica will take you to Piazza Vittorio Veneto and the civic gallery and museum. Here is a mixed bag of works by umbro-marchigiani painters - most important is Carlo Crivelli's Madonna and Child. If you have time, you might examine the fine carriages in the Museo delle Carrozze or brush up your modern Italian history in one of the country's best museums dedicated to the Unification of Italy and wartime resistance - you'll find them in the same palazzo as the pictures. Just north of the town, by the river at Villa Potenza, lies ancient Helvia Ricina. When the Visigoths destroyed this Roman settlement in the 5th-6th centuries, its inhabitants moved up to safer ground and founded Macerata. Remains of the old city can still be seen, including the large amphitheatre, which stands just by the junction with the SS571, as well as a stretch of stone-paved roadway. A few kilometres to the south of the city lies another outstanding monument. 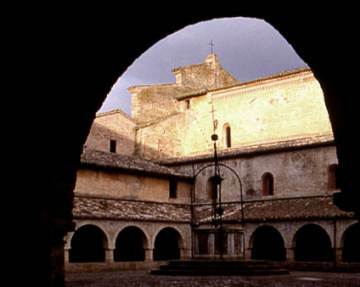 The romanesque church of San Claudio al Chienti is one of the region's earliest and most important churches. Its shape, quite unlike any other church in the Marche, is the first thing to strike you - it is in fact two churches, built one above the other, with separate entrances and flanked by two cylindrical towers. Built between the 5th and 7th centuries, probably on top of the ruins of a villa which formed part of the Roman city of Pausulae, it was constructed using material from the ancient ruins. Its present shape dates from the 11th and 12th centuries. Inside, both the upper and lower churches are square in form, and supported on four solid central pillars.